A genius student inventor, Beom Kim is posing for a portrait at 2016 Matriculation ceremony, held on February 24, 2016. Newly admitted undergraduates and returning students are ready to kick off one of UNIST’s biggest events of the year, the 2016 UNIST Matriculation Ceremony. This year’s ceremony featured the awarding of students with outstanding entrance scores, followed by greetings and remarks by President Mooyoung Jung and other distinguished guests. The Oath of Freshmen was also delivered by student representatives, SangHee Park (CheongJu ShinHeung High School) and SeungJin Lee (InCheon HyoSung High School) on behalf of the incoming freshmen for 2016. In the morning of February 24, President Jung urged the 400 members of the Class of 2020 gathered at UNIST Gymnasium for UNIST’s annual Matriculation ceremony, which officially welcomes the incoming freshman class. 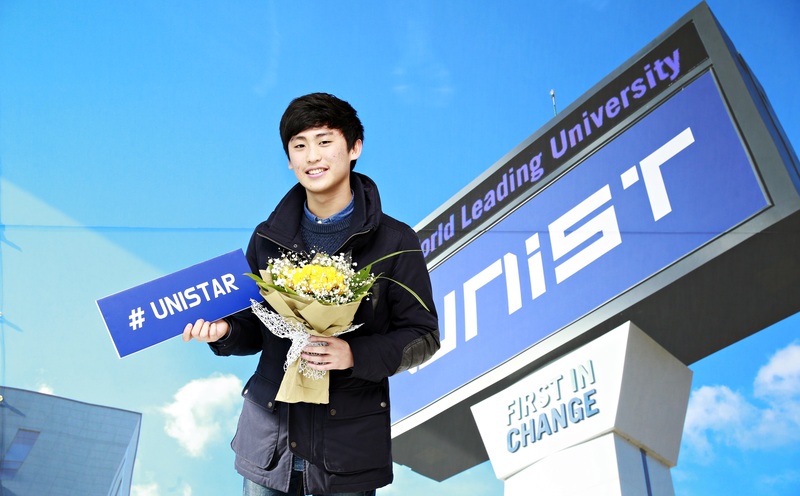 Among the freshmen of the class of 2020, was Beom Kim who was a graduate of Daegwang Invention Science High School) who has been admitted to UNIST through its special admission screening. An innovator, inventor, and dreamer, Kim has already accomplished so much at such a young age. Kim has been named on patents covering topics ranging from digital displays and battery chargers to portable handles for public transportation and artificial root devices, capable of keeping cut flowers alive. At the early age of 12, Kim has been awarded a total of three granted patents and had published 40 patent applications. Among them, he obtained a patent for technology to produce manicures with a special type of brush that resembles the tip of a highlighter to combat smudges on your nails. Kim has was admitted to UNIST via Start-up Talents Screening because his academic achievement at previous secondary studies indicated a reasonable probability of future academic success at UNIST. At UNIST, he hopes to gain practical overseas work experience, skills, and knowledge useful for his future career endeavors. In pursuit of his long-term goals, he would like to work abroad in a promising startup and be mentored by real entrepreneurs.